You don't have to spend money to have fun in a city surrounded by an outdoor playground. Salt Lake City, with its Wasatch Range backdrop, prides itself on being a recreational hub of the West. Take a hike in the mountains, swim in surrounding lakes, or bird watch on the shores of the Great Salt Lake. Lovers of culture and history can also engage in the Salt Lake City vibe by perusing a museum or hanging out at the farmer's market, all without ever opening your wallet. Park City and Big and Little Cottonwood Canyons offer both locals and tourists a reprieve from the hustle-bustle of this small Western city. Head up Little Cottonwood Canyon (home of Snowbird and Alta Ski Resorts) or Big Cottonwood Canyon (home to Brighton and Solitude Resorts) to ski, hike, or mountain bike. Then, follow it up with a bite to eat at one of the resort's restaurants. Alternatively, the interstate drive to Park City takes only minutes from downtown. Once there, engage in a plethora of outdoor activities or enjoy strolling the trendy downtown scene. Together with the city, Salt Lake County maintains more than 145 parks in the Salt Lake Valley. In fact, there are great parks located in almost every neighborhood. Liberty Park—the city's oldest and most famous park—boasts outstanding facilities that include playgrounds, jogging paths, tennis, swimming, a museum, and an aviary. Sugar House Park is popular with joggers and contains one of Salt Lake's best-known sledding hills. It's also the former site of the Utah State Prison but now contains playgrounds, a sports facility, and pavilions. Memory Grove, at the entrance of City Creek Canyon, includes a U.S. veterans memorial, a scenic bridge, a meditation chapel, walking and jogging paths, and an off-leash dog area. At 300 North Main Street in downtown Salt Lake, you will find a free museum run by the daughters of Utah Pioneers. The Pioneer Memorial Museum contains a large collection of artifacts and memorabilia from some of the earliest settlers to the Salt Lake valley. Peruse both the everyday items and ornate works of art belonging to the pioneers, while imagining the trek it took to migrate across the continent. When you've had your fill, check out the Fort Douglas Military Museum and the LDS Church History Museum or add a "free day" at another area museum to your itinerary. Friday Night Flicks brings family-friendly movies to a different Salt Lake park each week in the summer. Featured films include major Hollywood productions, experimental films, classics, kid's movies, and documentaries. Show up after 7:30 p.m. to reserve a blanket space on the lawn. Once the sun sets, kick back and enjoy the movie-du-jour on a portable big screen. Lawn games, giveaways, and free popcorn round off this event. Temple Square—Salt Lake City's best-known tourist attraction—is worth a visit for newcomers, especially those wanting to revel in the city's history. 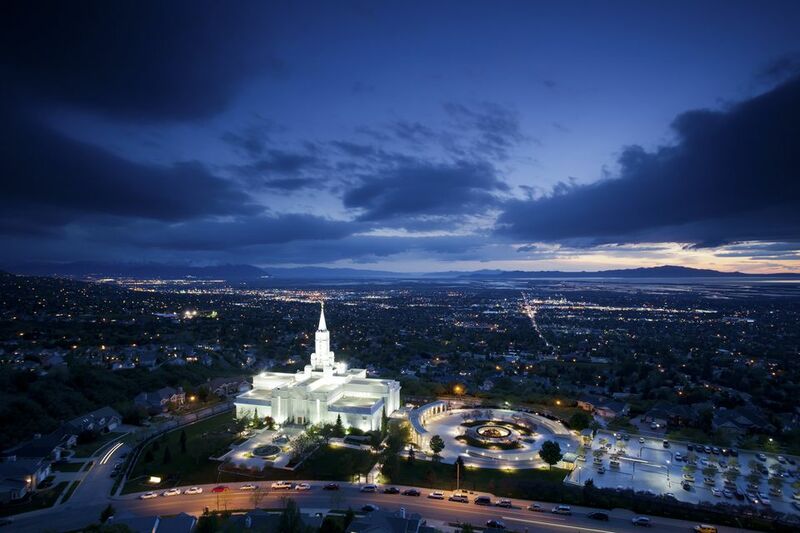 Find out why it took 40 years to build the temple while enjoying the spectacular spring and summer flower gardens or the amazing Christmas light display. Highlights include the North and South Visitor's centers, the Tabernacle, the Assembly Hall, the Family History Library, and the LDS Church History Museum. Hiking is fun, healthy, and free, and it's one of the most accessible outdoor activities in the Salt Lake area. Plus, you don't have to be an expert or an athlete to enjoy the area's hiking trails. Take an easy stroll around a lake near Brighton Resort. The Donut Falls trail offers the reward of a waterfall at the end of this three-and-a-half-mile hike. And for a more strenuous affair, climb Mount Olympus for some of the best views in the region. Even though it's in the middle of the country, Utah has great beaches. Just southwest of the city lies Blackridge Reservoir, with its sandy lakeside beach. Use of the area is free and facilities include restrooms, a playground, concessions, and gazebos with tables. Break out your paddleboard and get some exercise or beat the summer heat by floating around on a tube. Avoid this Herriman, Utah locale on weekends and holidays, though, unless you like crowds. Lovers of all music genres will enjoy the numerous free concerts throughout Salt Lake. In downtown, Excellence in the Community (a nonprofit arts organization) provides weekly concerts at the Gallivan Center from May through July. Catch local artists perform jazz, rock, and big band music while kicking back on their green lawn. Temple Square hosts recitals, concerts, and other musical events seasonally and most performances start at 7:30 p.m. And, Snowbird Resort's Cool Air Concerts get you out of the city and into the mountains to enjoy both local and national acts. Several regional towns in the Salt Lake area have free splash pads or interactive fountains where kids can splash around. If you're looking to take a down day or just need to beat the summer heat, head to Legacy Park in North Salt Lake. This park will keep the whole family busy with walking trails, shady hang-out spots, ball fields, picnic tables, and, best of all, a kid's splash pad. Reserve a pavilion in two-hour increments for hosting a large group or an outdoor party. The beautiful Utah State Capitol sits on a hill and looks over downtown Salt Lake City, welcoming guests to take a tour. The visitors center is open Monday through Friday from 8:30 a.m. to 5 p.m. and tours depart every hour. Choose from several different tour options like a self-guided tour, complete with brochures to plan your route. The Pioneering Women Tour (by reservation only) lends a look at the important historic women displayed in the artwork throughout the building. And a tour specifically suited to educators gives children and teachers a glimpse of the Gold Room and the Rotunda covered in magnificent murals. This tour also drops in on a real legislative session, too. Check out freshwater marshes, ponds, pools, sloughs, and mudflats at the Great Salt Lake Shorelands Preserve. This unique ecosystem is a robust feeding ground for tens of thousands of migratory birds each year. Here you can view over 250 species of birds as they make their way from Canada to the South, and back again. In fact, the area is frequented by so many feather friends that it's received the designation of a "Site of Hemispheric Importance" by the Western Hemispheric Shorebird Reserve Network. The grounds are located between the Farmington Bay Waterfowl Management Area and the Antelope Island State Park causeway. There's no better way to get the feel of a vibrant city than by visiting its farmer's market when fresh produce is in season. But the Downtown Farmer's Market in Salt Lake has a lot more than just fruits and veggies. This Tuesday and Saturday market offers a free kid's club, complete with fun—like a scavenger hunt—that foster healthy local eating. They also offer workshops for adults, too, like "Summer in a Jar" that teaches food lovers how to preserve market goods.